OK. There is no doubt that Facebook has great potential for marketing research, though one thing that I am not very fond of is survey and panel recruitment that just asks for the professional survey taker. In the market research world, a professional survey respondent is an individual who takes numerous surveys primarily for the monetary incentive offered. In some circles these individuals may belong to multiple email panels, take 10+ surveys per day, tend to be young, women, and can speed through a survey rather quickly. These individuals ARE NOT representative of the online population. The professional survey respondent is becoming a real problem in the online research world, and seems to fit the same profile as the heavy ad clickers. There are many efforts made to minimize the impacts of these respondents, identify them, clean them out of valid research, and is a real threat to all the legitimate panels and research work that is being done. This is why is burns me when I see recruitment methods such as the one I recently encountered on Facebook. Research is all about methodology and rigor. The ad displayed here is an example where poor research rigor is being exercised. A benefit of advertising on Facebook is supposed to be the ability to target based on profile parameters. Am I incorrect? If so, someone please correct me. Making an assumption that I am correct, this type of ad should not be necessary? Unfortunately this methodology opens up any individual, particularly the professional survey respondent to respond in what some call the Sally-Bob syndrome. That is, today I can take a survey as Sally, and tomorrow as Bob. 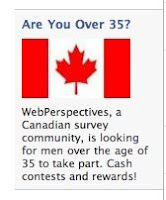 So if you want to make some money - maybe you'll get $10, chance to win $10,000 or 500 survey points, join a panel with your hotmail address and make sure you fill your profile out as being male, over 35, and while you are at it, making $150,000+ in an executive position. I assume no ill intent in this advertisement, but it is the responsibility for everyone in the research, marketing, and advertising community to be aware of the limitations to some recruitment methods, their potential risk, and the reality of the professional respondent. Unfortunately, for the online community there haven't been many options outside of the traditional 2,000,000 member e-mail panel and is in part a function of a lack of alternatives . . . . that is for the time being.